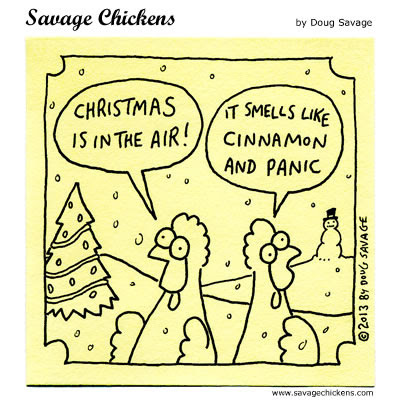 Posted on December 16, 2014 by Peady •	This entry was posted in Family, Happiness, Life and tagged 13, adolescence, chickens, Christmas, comics, remain calm, Savage Chickens, secrets to a calm Christmas, teen, teenagers, thirteen, tween, tween to teen, tweens, Zits, Zits comic. Bookmark the permalink. ← Supper In a Flash! I have to make a cake.. like.. ummm.. NOW!! A TEENAGER! Happy happy birthday! He had a lovely birthday! Thanks for sharing my post! And happy birthday to your teenager! It doesn’t matter what doesn’t get done. i’m so far behind I didn’t even get here on time and uh totally spaced on Wednesday! I am too late for much of 2014. Maybe we can call this a head start for 2015? ?